PHOENIX (August 8, 2018) – A new poll from OH Predictive Insights of Phoenix, Arizona has put Representative Martha McSally in the lead of the Republican primary, but continuing to trail behind in the general election to Representative Kyrsten Sinema. 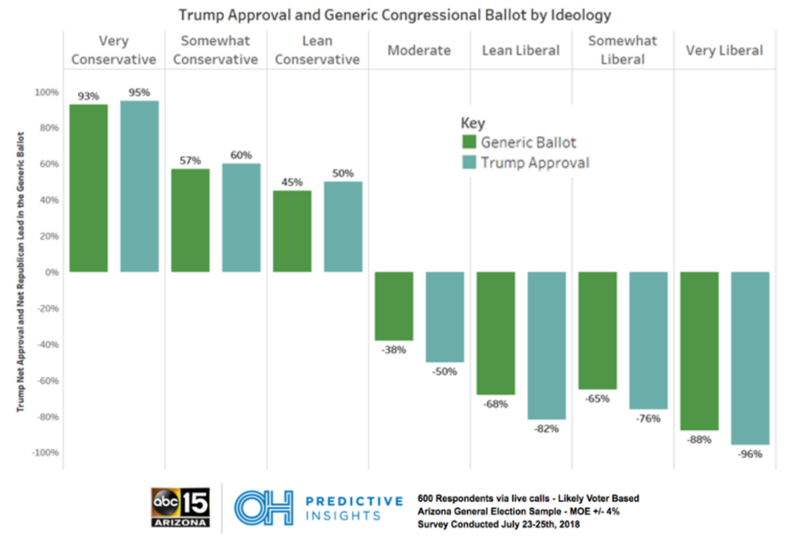 The poll also finds a recurring theme of Arizona moderate voters’ disapproval of President Donald Trump, which was first announced in our November 2017 poll, “Dangerous Slopes Ahead for the GOP in Arizona” and then again in the June 2018 poll, “Republicans Struggle With Moderate Voters.” This poll explores the theme for a third time looking at the most recent Arizona generic congressional ballot poll results and the correlation between Trump approval numbers. 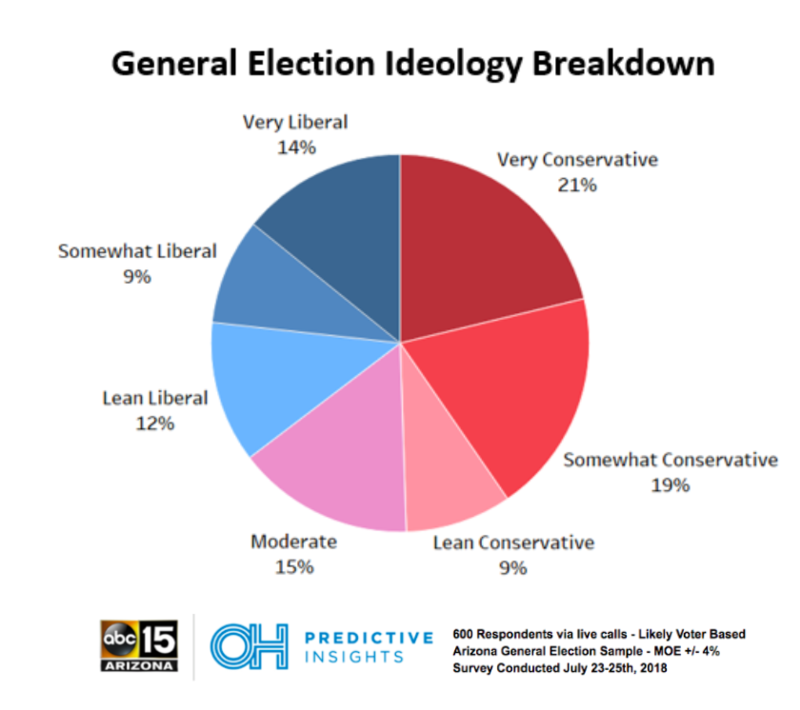 Arizona’s OH Predictive Insights and ABC15 Arizona (OHPI/ABC15) teamed up to find out why Arizona moderates are essentially Democrats. The chart below breaks up the sample by self-reported ideology to get a good understanding of the makeup of Arizona’s electorate. Here, moderates hold the delicate balance, but those identifying as conservative made up just under half of the voters. In this poll, the group of moderates looks similar to the sampled Democrats. The first indicator is in their top issue preference, as shown in the chart below. Statewide, 33 percent believe immigration should be the top issue, while another 31 percent said it should be education. 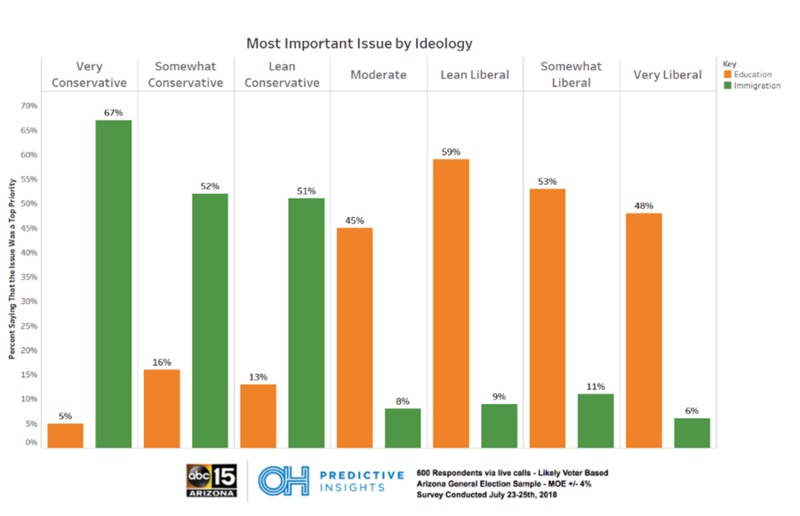 Conservatives, by overwhelming margins, believe the top priority should be immigration, while liberals believe the biggest concern is education. The numbers among moderates should be very concerning for the GOP since they are very similar to liberals, with 45 percent believing that education should take top billing, and immigration at only 8 percent. Overall, Trump’s approval was roughly even at 48 percent total approve (37 percent strongly approve) and his disapproval at 49 percent (44 percent strongly disapprove). When asked who the respondents would vote for in a congressional ballot, Republicans were ahead of Democrats 43-40 (R+3), while in 2016, Republicans would win the Arizona US House seats 52.5-43 percent (R+9.5). Looking back further to the Arizona 2014 midterm, Republicans would win the Arizona US House seats 55.7-39.4 percent (R+16). The chart below shows both net Trump approval and the net Republican advantage in the generic ballot. Not only does this line up, but among moderate voters, Trump had a net approval of -50 percent, and they backed the Democratic candidate by 38 percent, with 49 percent going to the Democrats and only 12 percent going to the Republicans, with an additional 31 percent undecided. “Conservatives still make up half of Arizona, but moderates have the power to turn Arizona from a red state into a purple one,” said Noah Rudnick, data analyst with OH Predictive Insights. Methodology: This 40% live caller and 60% automated phone poll was completed by OH Predictive Insights on July 23, 2018 and July 24, 2018, from a likely 2018 General Election voter sample. The sample demographics accurately reflected party affiliation, gender, region, and age. The sample size was 600 completed surveys, with a MoE of ± 4%. Poll report for the General Election poll can be viewed here.